Big solar producers should be feeling very, er, sunny. 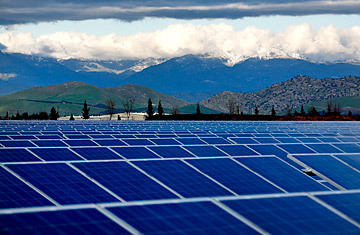 New solar power doubled last year globally, with the world adding 16 gigawatts worth of new photovoltaic energy. In the first quarter of 2011, installations of solar power increased 66% over the previous year in the U.S. Just last week the Obama Administration offered a $1.4 billion loan guarantee to help fund what will be the world's largest rooftop solar project, which put at least 733 megawatts worth of photovoltaic panels on commercial buildings across nearly 30 states while creating 10,000 jobs. Even bad news for the industry is good: a front-page story in Monday's Washington Post raised questions about why more than half of President Obama's out-of-town private-business visits had been to renewable-energy companies. Considering that the renewable-energy industry had to fight for any attention from Obama's hydrocarbon-loving predecessor, being criticized for getting too close to the White House seems like a significant step up. But there are clouds on the horizon for solar power  especially for big producers who want to build utility-scale projects, not just slap panels on rooftops. The miniboom in solar in the U.S. is being driven chiefly by U.S. Treasury grants  most funded by the 2009 stimulus  which have helped fill the gap created by the evaporation of private capital after the recession. The only problem is that stimulus funding is just about tapped out, the tax credits are set to expire in December and the mood on Capitol Hill is utterly hostile to more spending. If that government money simply vanishes and private capital fails to appear, the U.S. renewable-energy industry could be set back by years. And no one is at greater risk than those who want to build large-scale solar. "There's a big buildup in the industry pipeline right now," says Arno Harris, the CEO of Recurrent Energy, a utility-scale solar developer. "Financing could fall off a cliff." To understand why big solar is at such risk, you have to understand the brave new world of renewable-energy financing. Solar projects and wind farms can be risky  in some cases you're dealing with new technology, and you're usually producing electricity at higher prices than your fossil-fuel competitors. So straightforward private financing isn't always easy to come by. Renewable-energy companies could claim tax credits on the money they spend on projects, but of course, until they actually begin selling electricity they have little to zero profits, and therefore no tax bill to worry about in the first place. They need that money up front. Before the recession, there was a vibrant market in banks matching up renewable developers with companies that needed to offset the tax bill on their profits  but after the recession there were, to say the least, significantly fewer profits and little need by anyone, especially in the financial sector, for tax credits. If the government hadn't stepped in, the renewable industry might have been one of many victims of the 2007-08 financial crisis and recession. Federal stimulus spending not only saved the solar industry and its partners, it actually helped them thrive. Those billions in funds and loan guarantees were especially timely because European nations had begun winding down their expensive feed-in tariffs  long-term government-set contracts for renewable energy at favorable prices  that had helped build the global renewable-energy industry. (Even now, Germany and Italy account for two-thirds of the worldwide solar market, thanks chiefly to years of government support.) As a result of stimulus spending and a bit of help from Europe's global investments, "the U.S. has 30 gigawatts of utility-scale solar in the construction and permitting pipeline," says Harris. The problem is, should those tax credits expire  as they're currently set to do by 2016  and little additional government funding come through, solar companies could find themselves back where they were at the start of the recession. They can hope that private financing will begin to flow, but there's little evidence yet that banks are eager to lend out money for big renewable projects  especially with the national energy policy so uncertain. Big solar projects  many of which are done on federally managed land  are also held back by permitting headaches. The Sierra Club and other environmental groups have sued major solar-thermal projects in the deserts of the West on the grounds that construction may threaten endangered species. "Large-scale projects can take three to five years to get all the permits," says Kevin Smith, the CEO of SolarReserve, a California-based solar-thermal company. "That's significant." As fast as solar installation has grown in recent years, we still only get about 0.1% of the world's electricity directly from the sun. If solar energy is going to become something more than a rounding error, green groups may need to do everything they can to accelerate big-solar projects. And if private capital isn't yet ready to step up to the plate, the government needs to extend the loan guarantees and other funding that have proven so effective over the past couple of years. Otherwise we'll risk experiencing a rerun of the 1980s, when the U.S. was the undisputed world leader in solar and other renewable technology  only to surrender that supremacy when government support collapsed. "I'm optimistic, but I work in solar  I have to be optimistic," says Harris. I wish I could be so optimistic, but unless there's change of heart in Washington, the future may dim fast for American solar. Read "The Surprisingly Long History of Green Energy."